Since 2001 – nearly a decade before the Haitian Earthquake – Forward in Health (FIH) has been working tirelessly to provide medical aid in Haiti alongside countless doctors, nurses, and other volunteers. In January 2010, when the tragic earthquake struck, Forward in Health’s mission to improve the health conditions and dignity of the people in Les Cayes only intensified, as local need drastically deepened. Since the earthquake in January 2010, FIH continues to send volunteer teams to Haiti to provide clinical care, deliver donations, and lend much-needed support to the people of Les Cayes. Stateside, FIH, the Board of Directors, and numerous community supporters have spent hundreds of hours sorting supplies and collecting in-kind donations, lending technical support from afar, and raising funds for this worthy cause. Forward in Health also works closely with a talented in-country team, led by Hal, the Construction Manager and Evens, the Country Representative. Since 2006, FIH has dreamt of opening a permanent clinic structure in Les Cayes to sustainably serve the surrounding community – both when visiting medical teams arrive, and after they depart. After the earthquake, the local need for this clinic was even greater. With construction well underway, the FIH Health Clinic is thrilled to open its doors for the first time to the local community later this year. This clinic will provide care to Haitians who previously could not access healthcare services – and will truly breathe new life into realizing FIH’s central mission. 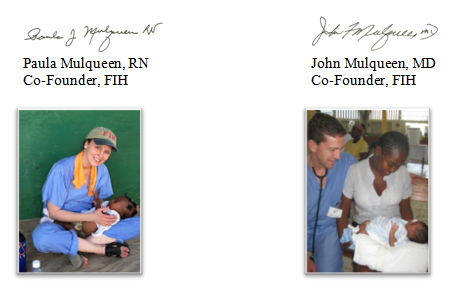 We thank you deeply for your support of FIH over the years, and your solidarity in our shared mission of providing quality healthcare in Haiti. We will be in touch soon with more exciting news on the clinic developments and how you can be involved. To see the latest updates about FIH, please visit our website at www.forwardinhealth.org and be sure to check out our Blog http://forwardinhealth.blogspot.comfor the most recent stories from Fonfrede.